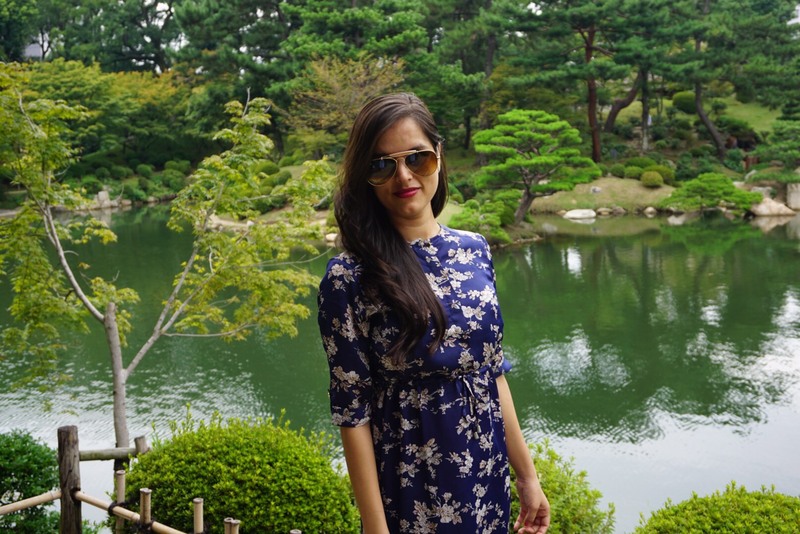 So I chose to wear this floral printed blue dress when I visited one of my favorite water gardens, I was waiting to visit for so long. Totally in love with this garden. There are so many colorful bridges, the red bridge I’m sitting on, has a bright red color with shiny polish, and it is the main attraction of this green garden. I found so many beautiful trees and flower, a huge group of golden and silverfish. I played with golden fish and flowers. No doubt I captured each and every moment. The blue dress has white flower print on it. The fabric is a very fine silk fabric which makes me feel so comfortable. It has a little shine and very smooth and soft touch. Its shine gives it a rich look.